Omigod, Vegan Cool Whip! Yeah, there are a couple of good store-bought options these days but this is really fun, makes a ton and tastes incredibly fresh and creamy. It’s better than cool, it’s rad! Perfect for topping pies, puddings, ice cream sundaes, your finger, a spoon, and any place else whipped cream might be appropriate. A few recipe notes: you blend this three times, once in the food processor or regular blender and then again with a hand mixer. Then it sets for a good long time and gets its final hand mixer whip. After it first sets in the freezer it looks a little rubbery and weird. Follow the directions and don’t be alarmed! It will magically and completely fluff up and smooth out when you blend it again, I promise. I’m telling you, this is faerie unicorn tear magick here. The recipe also calls for agar powder. You can often find it in an Asian super market for really really cheap, but you can order it online as well. It’s really worth ordering, since it’s an interesting and easy ingredient to use – you can make mousses, gelatins and all sorts of fun stuff. Our pie book will be using it in quite a few recipes, so why not stock up now? The only word of caution I can give you is not to over freeze during the first setting process. It should just be very cold, not frozen. OK, go forth and whip! Update: I changed the directions a bit to try and help with some of the problems people might have. The biggest changes are that there are now 3 whipping stages and longer setting periods. Place a large metal bowl in the freezer to chill, you’ll be using it to blend up the Rad Whip so make sure it’s big enough. Drain cashews and blend in a food processor or strong blender with coconut milk and 1/2 cup almond milk, until completely smooth. Rub it between your fingers to make sure there is no graininess left, this could take up to 5 minutes depending on your machine. In a small sauce pan, heat the other 1/2 cup almond milk, agar, and sugar. Bring to a boil, and let simmer another 5 minutes, stirring occasionally. Add the coconut oil and stir to melt. It’s important to make sure this doesn’t set while on the stovetop, so be sure to have the blender mixture ready. Stream the warm mixture into blender or food processor with the machine turned on. Blend for about a minute on high to incorporate lots of bubbles, then add the vanilla and pulse to mix. Transfer to the chilled metal bowl. Place in the freezer for about 30 minutes just to get it very very cold, but not frozen. When you remove it, it should be cold all the way through, and feel firm and even a bit rubbery. Don’t worry! You did everything right…watch in amazement as it transforms. Now take a hand mixer and beat like mad. It should start to soften and peaks should start to form, but it might take a minute or so. Once it’s smooth and fluffy, cover tightly with plastic wrap and place back in fridge to set again for at least 3 hours*. Now use a hand blender one last time to get it even more fluffy. *The longer you let it set, the fluffier it will get, so if you let it set at least 8 hours or up to overnight that is optimal. Keep stored in a tightly sealed container for up to 5 days. Looks DIVINE! And this pie book you speak of? Want. Now. This is TOTALLY RAD! I am agog to try it. I have a package of the strand-type agar agar they sell in the neighborhood Asian market. Do you know if grinding that up into powder will work the same as agar powder? Sounds very cool. The best of cashews and coconut (and almonds) combined! There is an awesome brand of whippable oat cream in Finland that’s indistinguishable from dairy cream. Too bad it’s quite full of nasty-sounding chemicals. I think I love you. Honestly, as much as I am ashamed to admit it, Cool Whip was the last dairy product to go for me. Until a couple years ago, I’d hide it in the back of my fridge in shame. Pie?!?! You’re writing a PIE cookbook?!?!?! OMG! Why did I sleep through that news? I jump around the room at the very thought! This also looks like the recipe I’ve been waiting for! 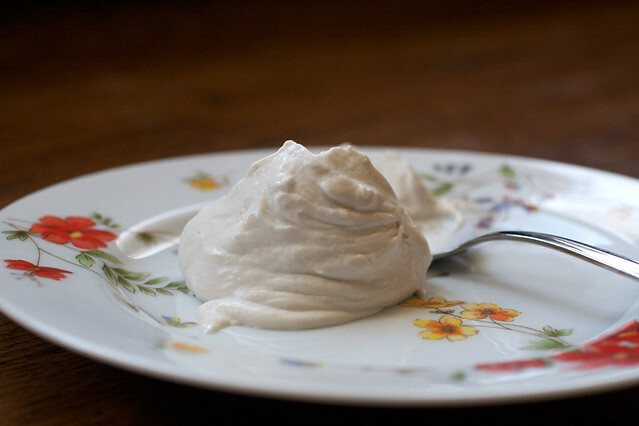 Smooth, creamy whipped topping and I’m going to eat it as soon as I pick up some agar powder! Faerie unicorn tear magick indeed! Yeah, could you give us an idea of the weight of agar used? Sounds awesome. The weight of the agar? I don’t really understand why you would need the weight or how I would weigh 3/4 teaspoons of powder? Unless you’re joking. Yes, we have one in the pie book! I did a coconut milk-only whipped cream with agar a couple years ago and do still love it, but I think I’d like the richness of cashews maybe a wee bit more. . . and this does look incredibly fluffy! Any ideas for how to sub for the sugar? A little agave would be good. Just curious: Why didn’t you use So Delicious unsweetened coconut milk instead of almond milk? I always have almond milk on hand, but that would work, too. Yay! my kids will love this in their hot chocolate.! OK, can I just say I love you? Do you think it’d be ok to sub agar flakes for powder? If so, what amount? And then it’d need to simmer for 10-15 min right? SOOO excited! Thanks for sharing! I’m allergic to nuts, can I sub tempeh? Can you whip it at the end with a stand mixer w/ whisk attachment? I haven’t tried that but I think a hand mixer will work better because you can really get in there and whip up and down and get the sides and everything. YAY! I can see myself eating the whole batch, hunched over the bowl with just a spoon, whispering softly to it like Gollum. wait…you’re writing a pie book??? Suuuper excited=me! Is this coconut milk from a can, or from the SO Delicious coconut based milk? This looks awesome, can’t wait to try it! Also, so so excited for the pie book! any idea when it will come out? Thanks! Some time in the Fall, probably October. Ms. Isa you’re wicked awesome. OMG pie……. You are awesomeness personified! Can’t wait for the pie book! I have the same question as Sandi, since the thickness of the two types of coconut milks is different. Don’t know if it would make a big difference, but I’d like to try it exactly as intended before experimenting. The So Delicious stuff would be “Coconut Milk Beverage.” It’s totally different, use coconut milk. can i use sweetened almond milk? For the person asking about agar powder weight, i’ve found that 1/4 tsp is about a gram. So 3/4 tsp would be about 3 grams. I tried it today and I think I must have done something wrong. It tastes great, but it didn’t fluff up very much. How much is it supposed to fluff up? It says at the top that it makes 6 cups – I don’t it think it increased in volume so much for me. Any idea what could have gone wrong? Sorry, it should say 4 cups. Can I see a pic of what it looked like? In testing we had problems with expired agar, but another thing is that it has to get very very cold. It’s possible that the next day it will fluff up more if you whip it again because it will be cold enough (if that was the problem.) It doesn’t have to stay very very cold the whole time, it just needs to get there for whipping. Thanks for the tips, I’ll keep what’s left (as I said, it tastes delicious, so we’ve been eating it anyway) in the fridge overnight and try to whip it again tomorrow. I don’t think my agar was expired, it did get quite firm and then when I whipped it started to fluff up just a little bit (it kinda formed peaks), but it’s still pretty dense and definitely didn’t increase in volume very much. Well, I’ll keep trying until I get it right because it tastes sooo much better than the soy-based whippable cream that is available in stores around here. how long will this keep in the fridge? i probably shouldn’t be eating 4 cups of rad whip by myself in one sitting. Also I was slightly under with coconut oil running out and I reading your recent comment I guess that probably contributed! I’m amazed at how little sugar you used in this recipe, I’m glad about it and hope my three year old will be too. I could use some unicorn tear magic, I cannot get this stuff to fluff up! Not expired agar & very cold. yay! i seriously would eat cool whip by the spoon when i was a kid. so happy to have a vegan replacement! i tried using my immersion blender with the whisk attachment at first but it didn’t fluff up very much, so i borrowed my neighbor’s hand mixer and it worked like a charm. 1) Make sure that the liquid had come to a full boil so that the agar is definitely activated. 3) Melt another tablespoon of coconut oil and slowly stream it into the whip with the hand mixer running. Mix it well and return to the fridge to set and then, once more, whip it up. And if you’re mixing with anything other than a dual head hand mixer, I’m not sure it will get the mojo needed to whip up. OK let me know if these help, there’s always some trouble shooting involved with a new recipe, but it DOES work, promise. Just in the nick of time! I was going to go buy an expensive a can of it. Can’t wait to try it. This blew my mind. And the minds of the 6 tasters until we licked our bowls clean and cried for more. I love you forever-never stop making our vegan world a tastier place! Can this be made with roasted cashews, or does it specifically need raw cashews? i’ve never experimented with cashews and wanted some advice. Anything labeled “cashews” is fine. They don’t have to be labeled raw. I think the ones just called “cashews” are not raw but heated in some way that is not roasted. I haven’t been able to get an exact answer from a reliable source so all I know is that they work! Are we supposed to use unemulsified coconut milk? Just made trifle with this, I’ll post a picture when I’m done and the unsuspecting Omni’s at the church auction have eaten it : ) Along with the Korma and a few other recipes of yours from VwaV! Mine didn’t increase in volume much either. I only have a stand mixer so perhaps that’s why. The flavour was divine though, very slightly on the sweet side for my taste but that’s just me. And I solved that by putting it in the freezer and getting out some of the best ice cream ever! Thank you. I have a stand mixer too, and it didn’t whip super crazy well, but after I tried the extra coconut oil trick and put it in the freezer for a little bit before the final whip, it went pretty well. I used it to make a vegan black forest cake, it’s looking pretty great! Thanks so much for this really awesome recipe! Did you make the almond milk yourself? Did anybody try this with soy, rice or oat milk? Does it get firm enough for nice decorations as in http://vegan.witscore.com/?p=431 ? baaaaah so good! I had to chill mine initially for about an hour but it turned out so damn well! WOW, this is AMAZING, soooo yummy, completely awesome. I had one little problem, which was that the agar agar I bought turned out to have sugar in it, like a ready-made-jello thing. I took a guess for the quantity, and I think I overdid it. It meant that after whipping, I could still detect some tapioca-like texture. Solution: I have a hand-held blender (immersion blender), and that, with some added almond milk, brought it into perfect smoothness. OMG, total nirvana. Thank you Isa for this amazing recipe! I seem to be sticking to this vegan thing, and my husband has been happily going along for the ride, and really it is all thanks to your amazing recipes, I honestly wouldn’t have done it without your recipes. Thank you! The whip was fluffy and ready to eat after the second whipping stage. I made a double batch and put it in the freezer for a total of 80 minutes, whipping it at 30 minutes and every 10 minutes thereafter. I used just the cream from 100% coconut milk and 4g agar powder (2g per batch). I tried this recipe yesterday and it didn’t fluff up. I might have messed it up with a lack of patience and a time crunch, but I tried adding more coconut oil to no avail. I still served it though, worked well as a fruit dip. I will try this again when I have the full time . Thanks for the recipe! Quick question: could I use soymilk instead of almondmilk (if yes, should I use an sweetened or unsweetened one)? I live in Holland and almondmilk is really expensive here (if you can even find it somewhere…). Yep you can use soy! Either sweetened or unsweetened. What’s un-vegan about store bought cool whip? Am I missing something? It’s got dairy and stuff! There are a few vegan ones on the market nowadays though, like Soyatoo. is this whip that was on the dessert at the fundraiser dinner you had in Omaha? I will try this regardless but that was really very tasty. Such a delayed comment, but this recipe is awesome! I made a vegan clotted cream version by adding more Earth Balance and used that to top vegan gluten-free scones. I also made a cardamom-rose water version and used that as a filling for vegan gluten-free cream puffs. When I made the clotted cream, there was a lot that I inadvertently changed about the recipe, half out of availability of resources and half out of just wanting to play around. It still worked beautifully. I did a lot better job sticking to the recipe when I made the cardamom-rose water rad whip. I love it’s so customizable, and that I can decide how much to make, instead of being stuck with a giant tub of vegan cool whip. I was extra stoked that the base recipe worked so well for clotted cream. Thanks so much for pioneering this one, and for giving me yet another excuse to buy cashews! I dont have any of your books but thats ok because it just means everyone will know what to get me for christmas and my birthday! My boyfriend just surprised me with a food processor after watching me struggle to make your olive lentil burgers with a blender (I guess youre partly to thank for my new toy :P) and I was looking thorugh your recipes on here to see what cool new things I can try and this came up. I think theres a hand mixer in his house somewhere, but if its not would it be possable to do it all in the food processor? Oh, and thanks for being so awesome! Any possible substitutions for coconut oil if I can’t find any? Thanks! Will this freeze after fully making? Probably a silly question, but I don’t want it to separate or anything weird! Thank you! How about for piping on some vegan cupcakes? I want something lighter than vegan buttercream to. will this be stiff enough? It actually is stiff enough! Lighter than buttercream, and they need to be kept cold, but it’s really great for cupcakes. Isa, or should I be addressing you a “Your Majesty”? You are the Queen of Cool!!! 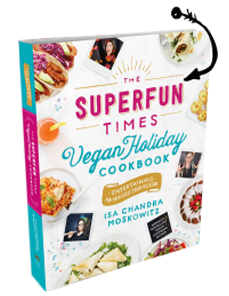 I am (not) very patiently waiting for the “Pie Book” to come out in Oct…….it’s already been ordered from Amazon…..I am really struggling though….Pleeeze hurry and make Oct. come just a tad faster…….lol How long have you been vegan? The other thought I had is that we should possibly be referring to you as St. Isa…….I read some of the comments in response to one of your other posts, and you definetely have the patience of a saint!!!! I don’t think you should freeze it for that long, however, mine lasted in the fridge, tightly sealed, for at least 5 days! Just made this and it’s fantastic. I noticed someone had asked if you could use Agar flakes…I did and it worked. I just used 3/4 of a TABLESPOON rather than a TEASPOON. It’s so much better than soy cream. I just thought as someone was talking about clotted cream…now I can make strawberry cream teas…scones with cream and strawberry conserve on top heavenly! It takes a little faffing around to make especially as I made my own almond milk but it’s fabulous. Now I have some almond milk left over to make the Latchkey lime pie…and I have some of this left to serve with it!!! Thanks Isa!! PS to Emma from Holland, I live in the UK and almond milk is expensive here too over £3 a carton around 4 euros, so I make my own. Soak a cup of raw almonds (cup measure is 225 ml measure for Europeans) in cold water over night in the fridge. Drain, then blend with a cup of cold water till smooth. Gradually pour in another 3 cups of cold water then strain through a jelly bag or muslin cloth. Voila almond milk! at a quarter of the price. Does this literally taste like cool whip rather than whipped cream? I grew up in a real-cream-only house and so I don’t like the flavor of cool whip.. but I am looking for a good whipped cream replacement. This looks heavenly, but I am curious – did you use a refined coconut oil for this or is it supposed to have a little coconuty flavor with an unrefined oil? I only ask because Trader Joe’s has virgin coconut oil for, like, 1/3 of the normal cost but I am on the fence about whether I want coconut flavored whipped cream. Thanks! I did use refined, so yeah, unrefined will give you some coconut flavor. Isa, you are truly a magician! I made this Rad Whip to top the Pumpkin Pie and Pecan Pie (all from Vegan Pie In the Sky) for Thanksgiving. All three were a HUGE hit. I had to stop myself from just eating the Rad Whip by the spoonful (and when I say “I had to stop myself”, I mean that I did so after the 8th or 9th spoonful)! Thank you so much for all of these recipes, but especially for the Whip. I can’t tell you how nice it was to top a pie without squirting something from a can! I loved making the desserts completely from scratch, something I wouldn’t have been able to do without you and Terry! I’m the only vegan in the family and these recipes not only “passed” with the omnis, it OUT SHINED the traditional versions of these recipes! P.S. In response to some of the comments above: I used all ingredients as stated in the recipe. The only thing I did differently is that I used an immersion blender with the whip attachment. Because of this I got a slightly more dense version of the cream, but I LOVED it that way! Also, when I did the initial blend I used my vitamix so it really heated up the mixture so I had to cool in the freezer for over an hour for it to cool all the way through before whipping. I made the recipe exactly as described in the book and it came out way too hard and not at all fluffy. Also, the color was distinctly tan, unlike the pure white shown in the book. Any ideas about what may have gone wrong? I make this stuff on a weekly basis, I love it!! If you can’t find raw cashews (as I can’t), or just don’t want to soak them, you can use roasted ones and grind them fine in a food processor. Works great. Thanks, man! Now I can live out my fantasy of licking whipped creme off Shaun Cassidy’s body! 🙂 Sorry…I’m a freak. This stuff is delicious. I made a modified version just from what I had in the house and it rules. I used pumpkin seeds instead. The first time I used agar flakes and they didn’t dissolve all the way and I didn’t get it thick enough. Today I was looking at the leftover coconut milk in the fridge and decided to whip it all up. I put around a cup of the leftover coconut milk in the blender and just dropped 1/2cup pumpkin seeds in with the blender running, blend until smooth. In the saucepan I put 1/4cup almond milk (storebought), 1/4cup filtered water, 1 tsp agar flakes, 2 tbsp real maple syrup. I boiled it for like 15 min to dissolve the flakes and then whisked in 2 tbsp peanut oil. From there followed the recipe, streamed hot into cold for 1 minute, 1 tsp vanilla, put in the freezer. The picture is after the first whip, it tastes so awesome. Love your recipes, they’re always great! Could I sub another nut for the cashews? Some in the family are not cashew fans like me. Wow this was crazy good! Non-vegan taste testers loved it and said it tasted really special! Not sure what happened but it worked the first time for me but didn’t set the second. Really watery. I must’ve done something wrong. Anyhow, no worries because I put the failed batch in the freezer and hey presto! Rad Whip Ice Cream! Delish. Thanks for a wonderful recipe. Question if I may and if I have missed the response some where below forgive me for the repeating it…..Is there a vegan version WITHOUT Nuts? My son is allergic to nuts on top of everthing else and we do mostly vegan eating but the NUT thing still eludes me on most days when working a recipe. Thanks so much and your site has been AMAZING for us a FAMILY!!!! Some extra coconut milk works! will this work in my cream whipper? I made this for the second time and have to say AGAIN how easy and wonderful this is! Thank you! Hi Isa, Did you shake the can of coconut milk or did you just use the thick coconut part that separates from the water? I know some recipes only want you to use the thick part that separates when it’s cold and some say shake it up well before using. Thanks! I’ve made this 2x, and it sets up softer than you suggest it should. I am following all steps carefully, except for one thing: I am using Blue Diamond Almond-coconut milk for the combined measure of coconut and almond milk. It might be too thin, compared to separate coconut milk and almond milks? If my 2nd batch (now chilling in the fridge) is too soft, then next time I will try a little less BD almond-coconut milk….and if the price ever comes down, separate coconut milk and almond milk. Hey Isa or any other experienced RadWhip makers…does this still taste of coconut when it’s finished? My boyfriend hates coconut (…nobody’s perfect). Hee. Ummm, I don’t think it tastes A LOT like coconut, but maybe if you hate it, you’d think so. Making (Arguably Inspired yet Bastardized) Vegan Tiramisu | Get Sconed! I followed all the directions and looked at the comments here. Mine is slowing whipping up but I noticed when I started the last whipping that it looks grainy. It doesn’t taste grainy, so I have no idea what is going on. Any ideas? This recipe did not work at all. I ended up with liquid. This is so yummy but it didn’t really whip up for me. I used agar flakes instead of powder and maybe I rushed it a bit. I’ll try again with agar powder. Nonetheless, it was a very nice thick topping and tastes like whipped cream only better. I can’t get hold of any coconut oil, is there anything I could use instead? This is lovely stuff. I ate half my first batch as cream and froze half in a little portion of ice cream. Two different but equal kinds of amazing. For the next batch I’ll try subbing the coconut oil for cocoa butter as it occurred to me that it would then be an authentically divine vegan white chocolate mousse/pudding. Yum! I’d recommend processed coconut oil for this as the extra virgin raw variety I had available left a strong coconut impression. Processed oil (a brand like KTC) has a lot of the flavour stripped out by the way it’s made. That seemed like a kind of cruel joke until I started using it for things like this. I love coconut but its only place with sugar is drizzled over pancakes with palm sugar syrup. At what point are the two mixtures combined? Hey Miss Isa, how do you feel about subbing lite coconut milk for regular? Possible to do without having to add more oil or alter anything else? The last time I made your lost coconut custard pie I used lite and it came out fine. Why didn’t I try this before now?! Thank you, Isa, for developing this incredible recipe. I just had this with your pumpkin pie, and I am in heaven. Thank you, thank you!